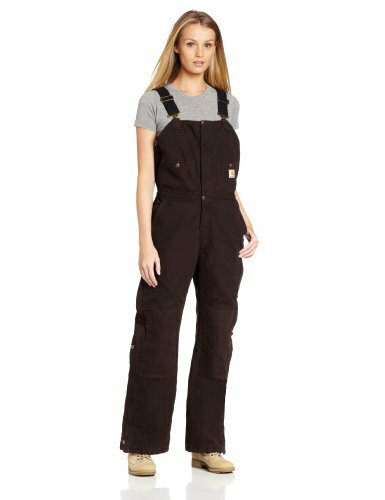 Finding insulated coveralls for women is no small task, though there are more styles and types becoming available all the time. Many women work outside in the winter and it is great manufacturers are starting to accommodate them. 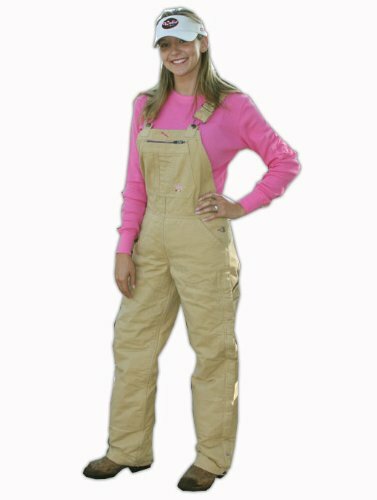 The traditional all-in-one insulated coveralls for ladies are almost impossible to find, so we will content ourselves with these awesome warm toasty bib overalls. These warm winter work clothes are the difference between getting on with the job in comfort, and being utterly miserable. If you are working outside in wintertime, farming, in construction, surveying or hunting, insulated coveralls are the key to making life easier at sub-zero temperatures. You can be more productive at those colder temperatures, while feeling and looking great. Often when conditions are cold and damp and above freezing, the chill spreads through you, so wearing warm work clothes won't force you indoors early. Needless to say, having warm dry feet is important and having great wellies or work boots is a must too. What do the Best Ladies Insulated Coveralls have in common? When buying women's insulated coveralls, either as a gift or for yourself, there are a number of features that make a set of insulated coveralls a good buy. The following points make for a good useful set of work wear. Thick cotton duck outer breathable fabric which means any moisture and sweat when you are moving around and working doesn't get trapped and cause you to chill. Duck is another name for a very short weave pattern that had a lot of wear and abrasion resistance. It also means if a hole is eventually made in the coveralls, it will not really run. This means less replacement and easier repairs if you are so inclined. Slippery taffeta type lining and ankle-to-hip leg zippers Credit: Amazonmean taking the overalls off and putting them on over bulky clothing is easy. Nothing is worse than being all bundled up and unable easily to get out of your insulated work clothes! Having a quilted thick light warm padding means less bunching and an even insulated warmth from your coveralls. Choosing a roomy, adjustable design that comes in multiple inseam lengths means even with varying leg and body length and chest size, you can be comfortable. The better your ladies coveralls fit, the easier it will be to move around and work in them and you will stay warmer with better circulation. That is why is is great to get the ladies designs of coveralls, so you get a good fit to your shape. Ladies coveralls with elastic at the back of the waist cut down on gaping, cold air on the back while making you look more feminine. The more open you can unzip your workwear, the easier and quicker laundry is, with tumble drying much faster. Having one or both full length legs unzip, as well as a deep zipper down the front and if there is a hood on the garment, then you can speed laundering and these sorts of workwear are recommended. Having a great stitching with reinforced knees and stress points, with metal rivets at corners joins means longer lifetime for your work clothes. Working, stretching, bending and wear on your lined coveralls means threads and seams can wear and break. Even laundering can be hard on your winter work-wear so buy a good quality set. Here's just a little fun, these pink bib overalls are cute Credit: Sierra Trading and comfortable. They have the ankle to hip leg zipper for easy on and off and laundering. They are made by Carhartt, a respected insulated coverall manufacturer. Carhartts hard-working customers usually review their product highly and Carhartt insulated coveralls are known to be second to none with their construction quality, stitching, comfort and longevity! These are available at Amazon to covenient combine with your other shopping there, including the matching Carharrt plum ladies insulated work jacket.